Do you see the silhouette in the nearby distance? It is not that of a man; it's a female hunter taking all the precautions not to scare away a deer. These days, more and more women head out to the woods to find out what has attracted males for centuries. The adrenaline, the drive, and the excitement about the first successful hunt are some of the reasons females want to partake what has come to be known as male territory for a long time now. There is no other magazine to offer and facilitate this freedom to women than Field & Stream. I have been reading this magazine ever since I can remember. It truly gives the urban dweller a sense of the abundant life and beauty of mother nature. Thanks to the mainstreaming of adventure, more and more women and minority groups are getting to be interested in traveling to the most remote places. A few months ago, a friend of mine and I were trekking in the back country of Sequoia National Park. To our surprise, we ran into a group of 4 women whom we knew from the city. They were hiking a few miles away from their camp sites. Thanks to magazines such as Field & Stream, adventure in hunting, bowing, fishing, game fishing, game cooking, and outdoor life, in general, can be manipulated, and guaranteed, and marketed to groups who were until now kept away. Field & Stream does a good job with its seasonal features. Its writers and editors, enthusiastic outdoors people, serve their readers with interesting articles containing various tips. For example, you can find the top 50 bass waters or top 50 places to fish for bass, 25 great American deer hunts, 20 roads to nowhere. Basically, you can find anything you want to improve your hunting and outdoor cooking. If you go to the Field & Stream website, you will be able to listen to 7-minute broadcast of interesting articles covering various issues. You can do this while reading and surfing the net. This is made possible through Real Audio. In all, what's certain is that this movement to find adventure destinations will go on. What's more interesting is that a brand new market is being created by women and minorities telling the rest of world that they want their share of fun in the great outdoor. There, to my surprise were first aid directions that I could really use. There were dog training tips that I enjoyed. Safety tips for being on the water were important to me. Our family enjoys the lake and the ocean is my favorite. I thought I was already using every water safety tip known to woman kind, but, I had missed a couple! Everyone should understand how to realize a storm is near, and the magazine gave all types of web sites for different types of stormy weather, plus ways to understand what is happening, by eyesight. I found a lot of gift ideas for my husband as I read through the articles, too. They were not listed as advertisements, they just fit right into his idea of fun in the outdoors and were not expensive. The pictures are beautifully done in color. You don't need to be macho, ladies, to read the magazine. It is full of health, safety ideas and what to do in emergencies that help us all out. Anyone in the Scouting programs would enjoy learning a great deal from this magazine, too. Don't limit yourself! Learn all you can! Share the interest your friends and family. It makes for a lot of conversational topics. Did you know white tail deer have started eating baby birds? Deer are not supposed to be carnivores, you know! That's a topic to discuss with conservationists, if I ever heard one. You can find a lot of things to read and to enjoy in Field and Stream. It is gender-all encompasing, and age appropriate for anyone old enough to understand that hunting exists. Give it a try, this Field and Stream, you will like it! I recommend it! For a quite some time I have had a subscription to Field & Stream. As an avid hunter and fisherman I like to be kept updated on the important issues of my sports. When the magazine arrives at my door I always flip to the departments section of the contents because of sections like Upfront, Fishing tactics, A sportsman's life, Vehicles, and Sportsman's notebook. I also belive in the idea of conservation, and two sections, called Conservation and Wildlife management keep me informed on what is going on across the country, and how to be a better conservationist myself. 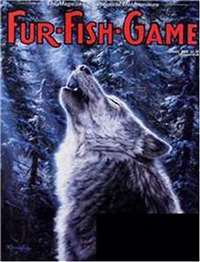 In two current issues March 2000 and April 2000 there was a two part article about the USFWS and the extinction of much of the wildlife in America. As well as the problems with the USFWS as a whole. There are many articles that tell you how to get the most out of your guns or poles. They cover whitetail deer, pronghorn, elk, and bear. Also bass, trout, and catfish. Another feature that I enjoy is the Midwest section found in mine, because of where I live, tells me of the important issues in the states surrounding mine. The Finally section is great because it tells a personal tale of a hunter or fisherman that make you feel good. This is only a small part of what Field & Stream has been for 104 years. Any hunter or fisherman should pick up a copy, and you too will subscribe. I have seen several different magazines that are similar to Field and Stream, but, in my opinion, there is no comparison. Field and Stream is definitely the best there is. Every time I get one in the mail, I sit down and read it from cover to cover. I have learned a lot from it about hunting techniques and animal behavior, and there are a lot of really good true stories in there by hunters, about their own experiences. Some of the articles are really funny, and others are just really informative. I like just about any magazine about hunting and fishing, but Field and Stream is my favorite. It is the only one I have ever owned a subscription to, and it has never disappointed me. With the proliferation of outdoors magazines on the market, it can sometimes be difficult for the newcomer to hunting and fishing to find the right magazine that gives him just what he wants, i.e., solid, reliable, well-written information by writers who have been there and done that time and again. Field & Stream remains the classic in the genre, which of late has been polluted and corrupted by such rags as Sports Afield and Men's Journal. 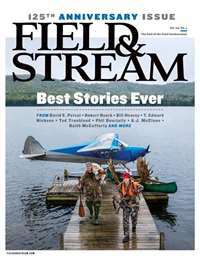 Field & Stream's strengths come from a number of points, including their editorial staff (people like Slaton White and David E. Petzal, who have been there forever), their stable of diverse, experienced writers, and how they select topics for coverage that every outdoorsman will find of use. Whether you want to know about trophy whitetail tactics, bass basics, seasonal info on stream trout, outdoor skills such as navigation and fire building, the details on rifles and shotguns, marksmanship, ammunition, knives, the best lures for all manner of species, great angling and hunting destinations, good books and videos, and so on, it is all here in Field & Stream. Every article is not only absolutely clear and to the point, but written with style by "duty experts" you can trust. This fine magazine stays well clear of kayaking, crocodile wrestling, yuppies in the outdoors altogether, BASE jumping, and all the other stuff covered by lesser magazines, of which there are quite a few. Make no mistake: Field & Stream is a magazine for serious traditional outdoorsmen who want to sharpen their skills in the woods and on the waters. If you don't fall into that category, move along. Field and Stream has been with us all for past generations and has taken us into the unknown future in the year 2000. The magazine has shown things from how to survive in frozen wilderness, to getting a embedded hook out of a hand. The most important contribution of this magazine is its strong ties with conservation of our country's wildlife. When biologists discovered that fish populations were diminishing due to the immense over-fishing and harvesting, Field and Stream was a pioneer in pushing for the foundation of catch and release. Many populations of fish were saved from the brink of extinction. Articles on how to prevent injury to fish, like using barbless hooks, have added to the success of the comeback. The avid readers have always and will still continue to read the exclusive articles written by professionals in the field. Along with words are the brilliant photographs that capture the action as if you were in the outdoors. The combination of print and picture is like a craftsmanship of its own. This magazine has incredible coverage of hunting and fishing. Sometimes it dedicates most of the magazine to hunting stuff such as how to pick out a good hunting rifle, how to train a dog to fetch a fallen bird, and other interesting things. And sometimes the magazine dedicates itself to fishing. There are two basic types of fishing, fly-fishing and regular line, hook and sinker fishing. After reading one of these magazines, I was really surprised and I have been subscribing to this magazine ever-since! Overall, this magazine is great for anyone who is interested in either subjects because each subject is covered very throughly throughout the year. Field and Stream is the best all around outdoorsman magazine. I am a hunter and fisherman, so Field and Stream is a great magazine for me. Field and Stream gives tips and information for people that hunt and fish. They give information on new products on the market and how good they are. They also give tips on hunting, fishing, and camping. Most of the tips are good too. Field and Stream has been around for along time and I think will continue to be around for along time. If you are a hunter or fishermen or just like the outdoors you should get Field and Stream. I have purchased individual copies of Field and Stream on and off for years, but until today I never actually considered subscribing. I've purchased the past three issues at the news stand and I've thoroughly enjoyed them. I'm not a hunter, but I do occasionally fish, camp, hike, and visit the target range. I'm also interested in sustainable living and emergency preparedness. The past few issues of Field and Stream that I've purchased have offered excellent information on fishing, emergency preparedness, hiking, camping, and wildlife preservation. I've also enjoyed their campfire recipes, gardening tips, and product reviews for things like binoculars, backpacks, firearms, and fishing equipment. Their articles seem to be written by very intelligent, nature-loving individuals that have a passion for wildlife preservation and a lot of outdoor experience. It might be wise to pick up single issues from the magazine rack over a few months before you subscribe; to help you decide if it's a subscription that you'll enjoy. I recommend Field and Stream for anyone that spends recreational time in the outdoors.